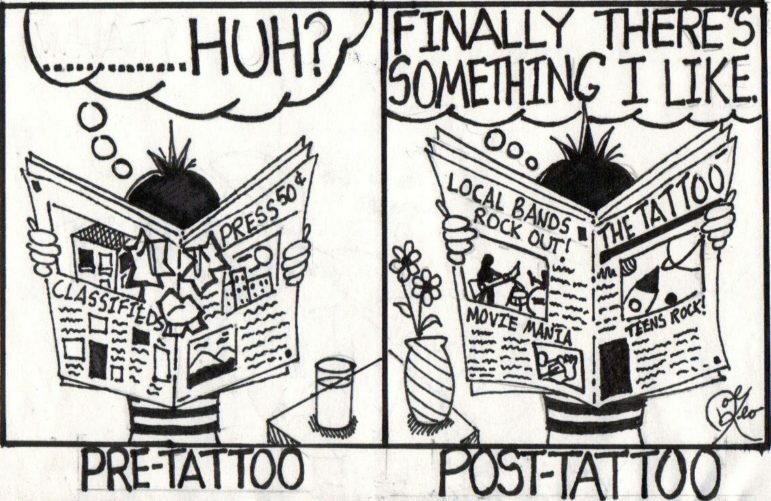 The Tattoo is a newspaper that appeared in print from 1994 until 2006, publishing the work of teens from Connecticut initially but ultimately from across the globe. It went online in 1996, the first website devoted entirely to student journalism, and remained online continuously until November 2015 when its provider pulled the plug. We hope to republish all of the work on this site in the months ahead. You can see everything from The Tattoo that’s on this website so far here. Meanwhile, almost all of the material from The Tattoo is available in the vastly important internet archives. This link appears to have at least the bulk of The Tattoo’s website archived and preserved: CLICK HERE. They can also be found here and here and here. More detailed links are likely to be added in the weeks and months ahead. Teen suicide, by many students, offering a wide-ranging series of stories about the topic. An index of all the issues. Writer’s index, with links to all of their stories. Awards won by Tattoo writers.